Dell’s P3418HW looks like a gaming monitor, but the appearance is deceptive: the 21:9 display is best suited to office use and in video playback. 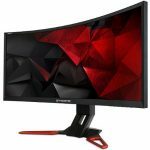 Curved monitors, also called “curved displays”, are mostly sought after by gamers. 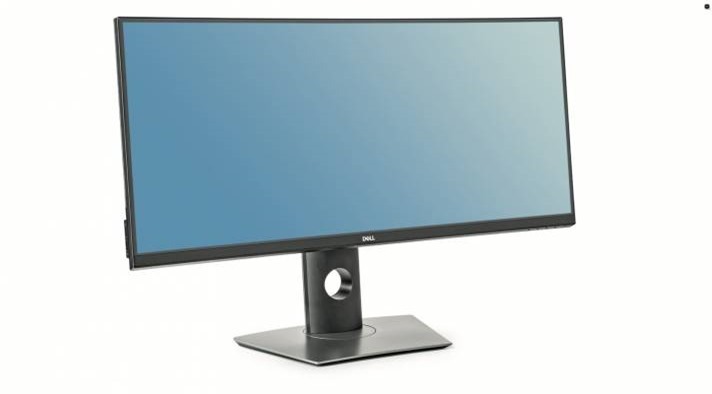 It is exactly them who are taking Dell’s P3418HW widescreen display: the display bends gently to the side edges and offers plenty of room on its screen diagonal of 34 inches. 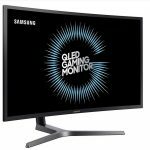 The monitor presents itself in a very conservative way. It begins with the matt finish on the panel surface, which is well suited to ergonomic work. Another positive: Dell has avoided using high gloss parts on the front up to the logo, and you can control the power LED. The curving is only slightly noticeable with a curved radius of 3800R – no more than that. Because of that, the image is not distorted when looking at photos or spreadsheets. For video playback, especially for films, the wider format is well-suited. The display shows 2560×1080 pixels, which results in a diagonal of about 87 centimetres in a small pixel resolution of only 82 dpi. To compare: that is like a 27-inch screen with full HD resolution. 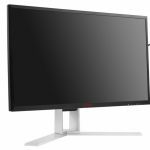 34-inch widescreens normally have 3440×1440 pixels (110 dpi). The image on Dell LCDs is therefore somewhat coarse. On letters there are gradations, which did not distract us during testing. Up close, the pixel pattern looks like a fly screen. Some users find the coarser and larger graphics make reading a bit more comfortable. Mechanically, there is nothing to complain about. The massive, solid plate is more stable and the mechanics are smooth enough so that you can adjust the display with one hand in height, tilt and orientation. Dell has narrowly hit the mark with its display frames; on the side it stays at 0.7cm and 0.8cm dark on top. Because the on/off button and the four menu buttons are on the edge of the LCD, it is a little uncomfortable to use. As such, the display swings out due to the strong leverage effect. The brightness can be set from a low 32 to a satisfactory 292 cd/m². The grey gradient is slightly streaky and the black could be fuller. The display shows the colours in a balanced and IPS typically way, non-reliant on angles, although the green has a slight tendency to go yellow. In general, the P3418HW has shown a good brightness distribution. The shutter times, however, are too slow for games, especially for fast shooters. With the “fast” setting (instead of “normal”), the Dell P3418HW shows noticeable streaks. At full brightness the display showed a low 43 watts from the plug, with ergonomics at 120 cd/m² it performed satisfactorily at 26 watts. Bottom line, with the Dell P3418HW you get a cheaper and ergonomic office LCD with a low resolution, on which the curve is mostly a gimmick. Previous Canon Rebel T5i vs T6i vs T6s, what’s the difference?